The Feast of the Nativity (probably a more accurate description for most Christians, and non-Christians, who stay whom on the 25 of December) is nearly upon us. This time of year, along with engendering quite a few more letters here on Letters from the Edge of Elfland, also tends to cause quite a lot of controversy, particularly over one issue. No, it isn’t the Keep the Christ in Christmas issue, nor is it the Happy Holidays controversy. It is the Santa Claus controversy. Every year we see a strange combination of consumeristic Santas (WestJet, Coca Cola, etc.) and Christians who have rejected the use of Santa Claus in their families. One such example, and the impetus for this letter, appeared on the Sojourners blog by Lincoln Christian University Professor of Counselling and Psychology Tara C. Samples. Samples’ article says this, ‘We have chosen to say “no” to Santa based on our faith, our understanding of social psychology, and commitment to economic justice.’ For Samples, Santa has become a means for consumerism and thus the continuation of economic disparity. There is a truly heart-rending Christmas song called ‘The Little Boy the Santa Claus Forgot.’ The basis of the short and simple song is that this little boy received no presents at Christmas because he has no Father, thus his family lacks the ability to buy him presents from Santa. I myself have at least one friend who determined quite early on the Santa Claus could not be real because the gifts she received from him paled in comparison to the gifts given by St Nic to her wealthier neighbours. Samples goes on to say, ‘The jolly old elf brought a lot of joy into my life when I believed, but as an adult I have discovered Santa’s magic is a poor imitation of God’s grace and his mythology brings joy to only a privileged few.’ Her point? Santa can now only bring joy to those with enough money to buy presents for their children. This is Samples’s main reason for discontinuing the Santa tradition. Samples does attempt to connect this consumerism to latent theology behind it as emphasised in this video by fellow Christian Joffre. In the video a little girls is said to have stated in Sunday School that the number of presents one receives is dependent on how sinful one is (perhaps she said it a little differently than that, but you get the idea). Instead, as most Christian parents do who choose not to have Santa in their lives, Joffre and Tara focus on the historical figure Nicholas of Myra. A rather common trend in this day and age. I want, however, to offer a critique. While I agree that Santa can be used to perpetuate bad theology and economic disparity, I’m not sure he’s outgrown his usefulness as Samples and this blog post suggests. Now I first want to argue that this is partly the reason I am a bigger fan of Father Christmas than Santa Claus. After all, Santa Claus literally means Saint Nicholas (Claus being another nickname for Nicholas like Nic/Nick). Having written on this subject already last year (In Defence of Father Christmas), I will leave it and continue to provide my defence of Father Christmas. The key thing about Father Christmas is having someone bigger than you or your parents to be thankful to at Christmas time. G. K. Chesterton writes in the ‘Ethics of Elfland’ section of his celebrated Orthodoxy, ‘Children are grateful when Santa Claus puts in their stockings gifts of toys or sweets. Could I not be grateful to Santa Claus when he put in my stockings the gift of two miraculous legs? We thank people for birthday presents of cigars and slippers. Can I thank no one for the birthday present of birth?’ For Chesterton, Santa Claus, or Father Christmas as I suggest, actually teaches us thankfulness. Author and Christian J. R. R. Tolkien believed Father Christmas to be such a good that he actually wrote letters from Father Christmas to his children each year. One might argue that in both cases these men came from (and had) economically privileged families. It would perhaps be mute to point out both that in their day Father Christmas rarely gave as extravagant gifts as he does today and also that Tolkien himself often wrote to his children letters from Father Christmas explaining why they did not get all the things they desired. Perhaps my favourite depiction of Father Christmas is the ghost of Christmas Present in Charles Dickens’s A Christmas Carol. Rather than a being as old as the nativity itself (see Tolkien’s Letters from Father Christmas), he comes from a family that can be dated back to the Christ event. This ghost’s chief purpose, beyond Scrooge’s salvation, is the spreading of Christmas cheer on food and conversations, those that are kindly given, but especially those that are poor, because, as the ghost himself says, they ‘need it most’. I personally use this, along with gift giving, when I write letters from Father Christmas to my nephews, and will continue to do so with my own children. There are many arguments I could attempt to make defending the place of Father Christmas in Christianity, from thankfulness for gifts received and joy in gifts given to being able to teach our children (and ourselves) that our very existence is itself a gift. I wonder though, if perhaps there isn’t a bigger issue. Consumerism. Many Christians today repudiate Christmas altogether because of the way the World has taken it over. Yet this seems to be the wrong attitude. If the World has taken something of ours, rather than it give it up as a lost cause, should we not seek to redeem it. To show how we can do Christmas differently, how we can do Father Christmas (or Santa Claus) differently? To be in the world and not of it, its something I write about quite often on here, particularly in relation to liturgy and the Church Calendar. Father Christmas, whose very name more evokes the Feast of the Nativity than Santa Claus does, can be the way we as Christians do that. By all means let him bring toys, but perhaps he also brings suggestions to the wealthier to help the poor (as St James seems to desire). Perhaps as Alison Milbank will suggest in the video below, we can create a community of gift-exchange that centres around Father Christmas, who centres around the Nativity. It should be remembered that C. S. Lewis, the author with whom Samples ends her article, used Father Christmas to signal the end of the reign of the White Witch in Narnia because he signalled the coming of Aslan into Narnia. 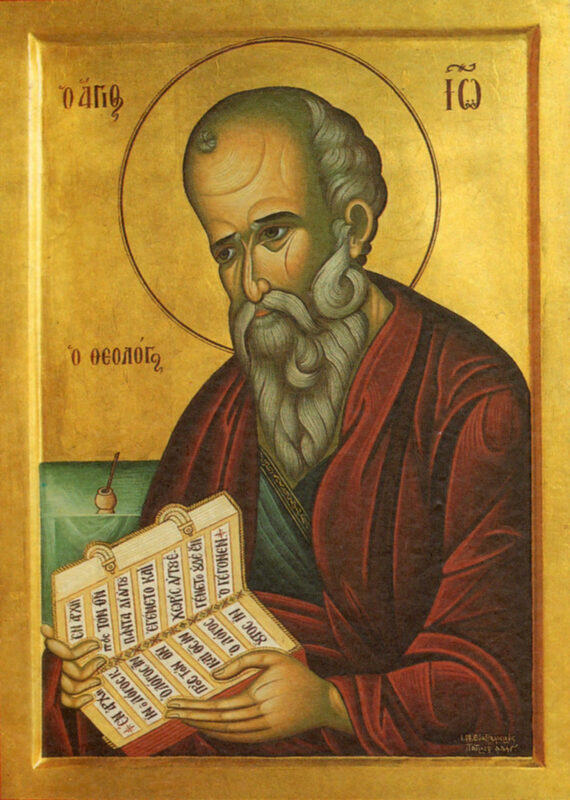 Today in the Church Calendar we celebrate the life of John the Evangelist, known in the Eastern Orthodox Church as John the Theologian. I love that we remember the author of John 1 in the middle of Christmastide. You see, as my friend Colin has written, Christmas Doesn’t End After Dinner. Christmas goes from 25 December until 5 January. Thus, as well as being the Feast of St John, today is also the third day of Christmas (hence the three french hens). John is called the theologian because his gospel is always seen as the most theological. When the gospels are represented by the animals in Revelation, John’s is always depicted as the eagle soaring above the heights of the other three because it is more theologically explicit about Jesus is. John tells us that Christ is the Word (or at least leaves that inference to us). He then tells us that the Word is God and yet with God, and that the Word took on flesh and dwelt among us. You see, this is the meaning of Christmas. God the Son, or the Word as John calls him in his prologue, became a human being, born of the Virgin Mary. But what does this mean? What we usually focus on, when it comes to God becoming human, or the Incarnation, is that Christ came to save us from our sins. He came to die, so he could defeat death and conquer sin so we could live with him in eternity. I don’t want to downplay the salvific significance of Christ’s coming, but I want to introduce another: God became man that we might become gods. As I’ve said in a previous post, I’m now working in my research on the topic of Christian deification. Part of what this notion is centred in is that when Christ became human he made humans capable of becoming gods. Our ability to become gods is only by his grace and our adoption into his Sonship. As the Scriptures say, we become partakers of the divine nature. As one of the possible collects for the Morning Prayer Service in the Anglican Church says, ‘as he came to share our humanity, so we may share the life of his divinity.’ God coming as a baby into this world was to do more than save us from our sins, it was to do more than redeem us, it was, in a sense, to deify us. It can sound scary to ears not trained to hear it, but it is the life to which we are called. I hope you all are enjoying the Christmas season. It is a time with family, as it should be, for family should remind us of Christ and his family: Scared (but obedient), young Mary and nervous (but noble) Joseph and the child they raised and named Jesus. As Christmas Day is fast approaching, I thought I would write on a subject rather close to my heart: Santa Claus, or as he is known here, Father Christmas. I believed in Santa Claus until I was 12, nearly 13. All in one day, I lost Santa, the Easter Bunny, and the Tooth Fairy. I realise that I was older than most when I stopped believing. I had to ask my mom pointblank. She said, ‘Do you want the truth?’ Yes. I did. And so she told me there was no Santa Claus. This didn’t shatter my world. Somehow, I still maintained a sense of magic and mystery in the world around me. A few months later, I would decide that Christianity, that Jesus was real and before my next Christmas I had dedicated my life and death, and whatever he chose to give me after, to Christ. I know that some parents are afraid of introducing Santa to their children because they may give up on God as well. I, however, can honestly say that being raised in a home that put no emphasis on God, loss of Santa did not make Jesus seem less plausible. I truly believe that belief in Santa, in magic in this world, prepared my pre-adolescent heart and mind for belief in one greater than Santa. I understand that Santa can be misused, he can become the face of crass consumerism and can make children of less wealthy families feel misused and abused by the goodly giver who gave them less than the rich boy down the street. However, I think as Christians we ought to take another look at Santa, or as I have come to prefer, Father Christmas. The reason I prefer Father Christmas to Santa Claus is twofold. First, by making him Father Christmas we detach him from the real figure Sinterklaas, or St Nicholas about whom I wrote on his feast day. This allows us to discuss who the real St Nick was and what he did (i.e. giving gifts and punching heretics). Second, by using the title Father Christmas, he can be as old as the birth of Christ, connecting us ,even more firmly than the Bishop of Myra, to the event that we celebrate in the Feast of the Nativity, namely, the Incarnation of God. Father Christmas can become a figure directly linked with the giving of the gift of God become man. One thing I do to support the belief in Father Christmas is to write to my nephews every year a letter from Father Christmas. I got the idea of Tolkien and have used similar, but never the same, characters he used to populate the North Pole. This way I can give them a bit of fun, as some kind of adventure or other seems to happen each year, but can also introduce notions about the true meaning of Christmas, that the world is a place where ‘magic’ can and does happen because of the God who created and upholds it. Below is yet another video from the splendid Alison Milbank. Please watch it and consider incorporating Father Christmas into your family and your community.